19th Century American Landscape Painting Movement. The Last of the Mohicans (1826) Scene.  What Was the Hudson River School? What Was the Hudson River School? The 19th-century Hudson River School of landscape painting consisted of a loose-knit group of painters, inspired by Romanticism, who were based in New York City during the 1850s, and who came under the influence of the English-born artist Thomas Cole (18011848). Most were members of the National Academy, as well as clubs like the Century, and a number painted at the same location - the Studio Building on West Tenth Street. Due to his exemplary work, Cole is traditionally considered to be the "founder" of the school, despite the fact that he played a relatively minor role in its evolution. Aside from Cole, the most successful painters associated with the School include the German-American artist Albert Bierstadt (1830-1902), and the wilderness painter Frederic Edwin Church (1826-1900), Cole's former pupil. After Cole's death in 1848, Asher B. Durand (17961886), President of the highly influential National Academy of Design, took over as leader of the Hudson River School, and in the late 1850s published a series of "Letters on Landscape Painting" outlining the attributes of the School's signature style of idealized naturalism. Initially, most works by Hudson River School painters captured the scenery of the Hudson River Valley and its environs, including the Adirondacks, Catskills, and White Mountains, although this widened in later years to include scenic views of the Far West and other locations across America. Most Hudson River School paintings were based on plein-air drawings that were later worked up in the artist's studio, and - while they included some details of actual places - usually consisted of composite scenes taken from a number of real and imaginary locations. Cole arrived in New York City in 1825, fresh from a stint as a portraitist in Ohio and Pennsylvania. Bent on making his name as a landscape painter, he went on a painting trip into the Catskills in upstate New York. On his return to New York city he placed three landscape paintings in the window of a bookstore, which (amazingly) came to the attention of John Trumbull (1756-1843), William Dunlap (1766-1839) and Asher B Durand (1796-1886). Trumbull was so impressed that he bought one of the works and introduced the young artist to several of his friends who also became patrons. Cole's significance as an artist lay in his exploration of the Sublime element (an aesthetic idea associated with notions of awe and vastness) in the American landscape, something no other American painter had so far attempted. Sadly, as Cole matured, his focus changed. Thus while his early landscapes, mostly completed in the 1820s, reflected his genuine appreciation for the beauty and naturalism of the American wilderness, his later paintings, completed during the 1830s and early 1840s (and strongly influenced by JMW Turner), reflected his fear that American materialism would destroy the scenery he loved, and so became more allegorical and unnecessarily melodramatic. Asher Durand, who only took up landscape painting in his mid-30s, was more influenced by the naturalism of the English master John Constable (1776-1837) than the complex expressionist canvases of JMW Turner (1775-1851) admired by Cole. Thus, when he came to write his "Letters on Landscape Painting", Durand deftly sidelined Cole's mature but melodramatic style, and advocated instead a straightforward method of plein-air sketching shorn of most philosophical content. Designed to capture the light and tranquility of the American scenery, this approach dovetailed nicely with the changing aesthetic of vacationing patrons, anxious to reduce the pressures of urban society, and was enthusiastically taken up by artists like John F. Kensett (181672), Martin Johnson Heade (18191904), Worthington Whittredge (18201910), Sanford Robinson Gifford (182380), Jasper Francis Cropsey (18231900), and Jervis McEntee (182891). These two painters charted a course somewhere between Cole and Durand. Church, inspired by the scientific writings and experiences of the German naturalist Alexander von Humboldt, substituted scientific and spiritual concerns for Cole's historical and heritage worries. He produced a number of large-scale paintings depicting the natural beauty of water, mountain and sky - such as Niagara Falls (1867, National Gallery of Scotland), and Heart of the Andes (1859, Metropolitan Museum of Art New York). As well as the Americas, Church painted the Arctic and Palestine. Church's main rival during the 1860s was the German-born, Massachusetts-reared Albert Bierstadt, who went back to his native country to study art at the Dusseldorf Academy - assisting the visiting Missouri painter George Caleb Bingham (1811-79) in the process - before returning once again to America, where he did for the American West what Canaletto and Guardi did for Venice. One of his specialties was mountain landscapes painted on enormous canvases: for example, Rocky Mountains (1863, Metropolitan Museum of Art New York). The public liked his wild scenery with its mists and clouds and exaggerated light effects and paid high prices. Although based at the Tenth Street Studio Building in New York, he toured several times throughout the West, and also visited Canada, Alaska, Europe, and the Bahamas. The Hudson River School began to lose its allure from about the end of the Civil War, not least because of the impact of the French Barbizon School of Landscape Painting, whose softer, more intimate style proved increasingly attractive. The Barbizon idiom was pioneered in America by George Inness (18251894) who - by the mid-1880s - was the most highly regarded landscape painter in America. 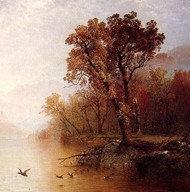 It was during its decline that the name Hudson River School was first coined, allegedly by Clarence Cook, art critic of the New York Tribune. For fifty years, the romantic, awe-inspiring paintings of the Hudson River School captured the imagination of the American East Coast, whose inhabitants had little if any first hand experience or photographs of the wilderness scenery of America. During its period of activity, it spawned several other painting styles, including Luminism and the Rocky Mountain School. It was the first real American painting fraternity, and one which shared a belief that the American landscape was a natural manifestation of God. One of the biggest collections of paintings by Cole and other members of the Hudson River School can be found at the Wadsworth Atheneum in Hartford, Connecticut, while others can be seen in many of the best art museums in America, including: the Metropolitan Museum of Art, the Brooklyn Museum, the New-York Historical Society, the Frances Lehman Loeb Art Center, the Newark Museum NJ, the Detroit Institute of Arts, the National Gallery of Art Washington DC, Smithsonian American Art Museum Washington DC, the Albany Institute of History & Art, the Gilcrease Museum Tulsa, and the Westervelt Warner Museum of American Art Tuscaloosa. For details, see: Art Museums in America. To these artists one might also add the name of George Caleb Bingham (1811-79), one of the best landscape artists in America, who spent most of his painting life in Missouri, but pursued very similar aesthetics to those of the Hudson River School, and was closely associated with Luminist landscape painting. 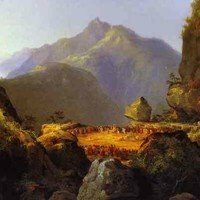 Here is a short list of some of the more famous landscape paintings of the Hudson River school. NOTE: For examples of 20th century American landscape painting, see the Iowa-born artist Grant Wood (1892-1942) and the Pennsylvanian Andrew Wyeth (1917-2009).  For more about oils and watercolour painting, see: Homepage.